I know you know all about red gazpacho. That liquified salad, which calls itself a meal because at it's base, the salad has been thrown into the blender along with the side of bread. It can be spicy or mild, smooth or chunky, and always refreshing. But for a great red gazpacho, you need great red tomatoes (okay, any tomatoes, as long as they're great). For now, we're still stuck with hot house tomatoes, and those just will not do. So red gazpacho has to wait it's turn, even if the summer heat practically demands its appearance. I have good news. There's another kind of gazpacho. A white kind, with no tomatoes. It's still a meal, because you still include that side of bread, but it's creamier, by far. A little thinner, and milky white. Its flavor reminds me a bit of buttermilk, but without the curdling flavor. There's almonds and garlic (raw garlic), salt and a little vinegar. It's garnished with homemade croutons that have been toasted in more garlic and plenty of butter, and finished with a handful of fresh, juicy green grapes. It's even better than it sounds. At first I was a little unsure. 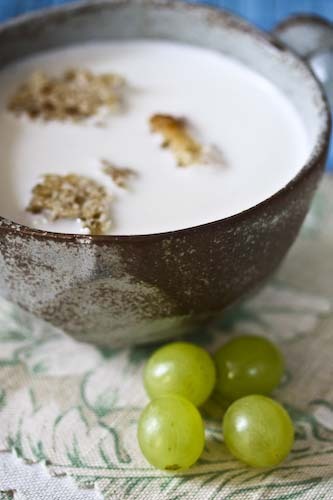 What are grapes doing, after all, in my chilled savory soup? Plenty, as it turns out, because green grapes are a little bit tart and play so well with the slightly vinegary soup. I really do think you're going to like this one. Put the almonds, garlic and salt into the bowl of a food processor and process until the almonds are finely ground. In the meantime, soak the bread in cold water so that it's good and saturated. Ring the bread out to extract any extra moisture, and with the motor running on the processor, add the bread. Pour in the oil in a thin stream, as well as the vinegar. You might have to scrape down the sides of the bowl at this point. With the motor still running, add 1 cup of the ice water and process until everything is well combined. Transfer the mixture to a large bowl and add the rest of the ice water. Stir to combine. You can strain if you'd like, but with food processors these days, it's not altogether necessary. Chill and serve cold, topped with croutons and grapes. 6 slices white bread, crusts removed, torn into small cubes. Melt the butter in a skillet and add the crushed garlic. Cook for just a moment, then throw in the bread cubes. Stir them to coat with butter and garlic. Toast the bread over a very low flame for about 30 minutes, until the bread is golden brown and crunchy. You'll need to stir occasionally. Cool. Do NOT skip the grapes. They're not decoration since they drop straight to the bottom, but are essential to the soup's flavor. You've been warned. what an interesting recipe! I ve never heard of white gazpacho. sounds great though! We went to Malaga for our honeymoon but the gazpacho I ate there was still red. This looks amazing. So interesting! I've never heard of white gazpacho, but with almonds and garlic in that sounds amazing. I'm so curious to try this! Just like snooky and indigo, I've never heard of white gazpacho - but I'm fascinated. Adding this to my list of stuff to make, immediately if not sooner. Love it! And love the site. I also have never heard of this- looks really interesting!